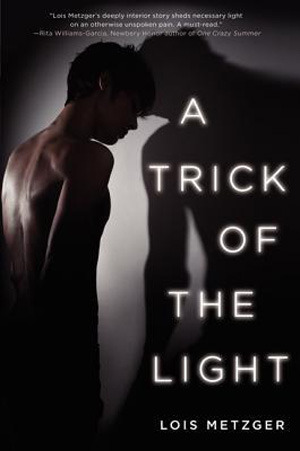 Telling a story of a rarely recognized segment of eating disorder sufferers—young men— A Trick of the Light by Lois Metzger is a book for fans of the complex characters and emotional truths in Laurie Halse Anderson's Wintergirls and Jay Asher's Thirteen Reasons Why. Mike Welles had everything under control. But that was before. Now things are rough at home, and they're getting confusing at school. He's losing his sense of direction, and he feels like he's a mess. Then there's a voice in his head. A friend, who's trying to help him get control again. More than that—the voice can guide him to become faster and stronger than he was before, to rid his life of everything that's holding him back. To figure out who he is again. If only Mike will listen. When I picked up A Trick of the Light, I have to admit, I was really excited to see that someone was actually talking about male eating disorders. Not to diminish the problem at all, but like sexual assault, society tends to only talk about the female side of things. Anyway, I was glad to see the book existed and was definitely hoping it’d be something I could pass along to the high school english teacher in my life for their classroom library. As it turned out, I was less enthused when it actually came to reading this book. Mike still can’t move, stuck in the stinky tunnel. He thinks, Am I crazy? Right from the get go, we’ve got some serious problems. If this were a script, I could adapt. It’d be great. I’d settle in and get immersed in the world and things would have the potential to be awesome. It’s not. I’m not even sure the book knows what it wanted to be when it grew up in the first place. A lifetime movie, perhaps? I don’t know. At this point, I’m really uncertain if I want to know. Wait. No. I don’t. That’s how underwhelming this book is. If it were a good read, I’d probably find myself either a) ignoring the weird formatting or b) finding someone to shove the book at so I could talk about both the content and the presentation. The book itself is written in first person, but not the main character’s perspective, of course. At first, I thought this was going to be one of those books that’s told by some well-meaning therapist clearly not at all just using an imagined client to make a buck and tell some cautionary tale. No, instead the story is awkwardly told by the voice in the main character’s head. I wish I were making that up. Not only that, but it takes a good twenty pages for that to be made clear. There were a lot of potential ways to go about having a toxic inner voice narrate a book. This could have been done beautifully and instead it was just, frankly, boring. I wasn’t left with any feeling by the time I finished this other than that I’d wasted my time. Several hours and nearly 200 pages later and I found myself somehow even more ambivalent about the characters than I was when I’d begun this journey I had such high hopes for. A Trick of the Light is preachy and unmemorable. It’s yet another piece of work in the already too extensive catalogue of books written by people who have done their research, yes, but couldn’t seem to form that knowledge into an actual story worth taking the time to read.